Asbestos is the general name for a wide variety of silicate minerals, primarily silicates of calcium, magnesium, and iron. Silicates are commonly occurring minerals that all contain a characteristic combination of silicon and oxygen similar to that found in silicon dioxide (sand). The two most common families of asbestos minerals are called the amphiboles and serpentines. Most people know of asbestos today because of health problems attributed to it. Prolonged exposure results in a pneumonia-like condition known as asbestosis, which is often fatal. All asbestos fibers are more or less rigid and more or less noncombustible. Their resistance to burning is, in fact, responsible for their name. The Greek word asbeston means "noncombustible." Because of its unusual properties, asbestos has an interesting history. The ancient Romans were said to have woven asbestos wicks for the lamps used by the vestal virgins. (The vestal virgins were women who watched over the temple to the goddess Vesta.) And a story is also told about the Frankish king and emperor of the West named Charlemagne (742–814), who sought to impress barbarian visitors by throwing a tablecloth woven of asbestos into a fire. One of the first complete scientific descriptions of asbestos was provided by J. P. Tournefort in the early 1700s. He explained that the substance "softens in Oil and thereby acquires suppleness enough to be spun into Threads; it makes Purses and Handkerchiefs, which not only resist the Fire, but are whiten'd and cleansed by it." Travelers to North America in the 1750s also told of widespread use of asbestos among both colonists and Native Americans. The largest supplier of asbestos minerals has traditionally been Russia (or the former Soviet Union), which accounted for about half of all the asbestos mined in the world. The second largest source has been Canada (about 30 percent of the world's output), followed by the European nations, Zimbabwe, China, South Africa, and the United States. Asbestos occurs either in seams that run at or just beneath Earth's surface or in veins that may go as deep as 300 meters. One method of quarrying the seams is known as block caving. In this process, trenches are dug underneath an asbestos seam and the whole section is then allowed to fall and break apart. In another technique, open seams of the mineral are plowed up and allowed to dry in air. Underground veins are mined in much the same way as coal. The distinctive fibrous character of asbestos makes it relatively easy to separate from other rocky material with which it is found. contains about 12.5 percent asbestos and the remainder, portland cement, which is used for a variety of construction purposes. Most asbestos cement is fabricated (processed) into corrugated (wavy) or flat sheets to be used as a building material in industrial and agricultural structures. The cement can be altered by adding various materials to improve its thermal (heat), acoustical (sound), and other properties. Some asbestos cement is also used in the manufacture of heating ducts and piping. 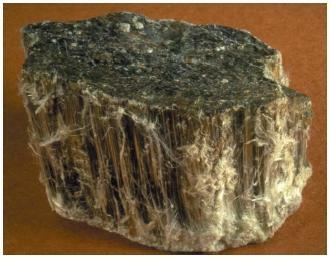 Long-fiber asbestos is more commonly used in the production of fabrics. It can be woven alone or with other fibers (such as glass fibers) to make protective clothing for fire fighters, brake and clutch linings, electrical insulation, moldings for automobile components, and linings for chemical containers. Asbestos cement: A composite material made by mixing together cement and asbestos. Asbestosis: A disorder that affects the respiratory tract as a result of inhaling asbestos fibers, leading eventually to a variety of serious and generally fatal respiratory illnesses. Fabricate: To shape a material into a form that has some commercial value, as in shaping asbestos fibers into a flat or corrugated board. Fiber: A long, threadlike material, often used in the manufacture of cloth. Quarrying: A method by which some commercially valuable substance is extracted, usually from Earth's surface. Shingles: A name given to shorter fibers of asbestos. During the first half of the twentieth century, asbestos cement was widely used for construction. In many respects, it was the ideal building material: strong, fireproof, and a good insulator. Untold numbers of homes, schools, office buildings, naval ships, and other structures were built with linings of asbestos. After World War II (1939–45), scientists discovered that asbestos fibers can cause a variety of respiratory disorders in humans, such as lung cancer and asbestosis, a pneumonia-like condition. Discovering the relationship between asbestos and these conditions took a long time; the disorders commonly do not appear until 20 years or more after a person is exposed to asbestos. Individuals most at risk for asbestos-related problems are those continually exposed to the mineral fibers. This includes those who work in asbestos mining and processing as well as those who use the product in some other manufacturing line, as in the production of brake linings. Over the past two decades, massive efforts have been made to remove asbestos-based materials from buildings where they are especially likely to pose health risks, as in school buildings and public auditoriums. Recent critics of asbestos removal maintain that—if not done properly—the removal process actually intensifies the problem by spreading more asbestos fibers into the air. I drilled the external walls of my house (built 1974). Each time a white, soft, highly fluid powder came out from the holes. It flew continuously became airborne quickly and made me cough. Could this be asbestos? Can someone answer a question for me.When was corregated roofing asbestos invented or introduced?